It has been 10 years since LSU's play-caller Steve Ensminger was the offensive coordinator at Auburn, but Saturday's game will be normal just like the others, according to Ed Orgeron. 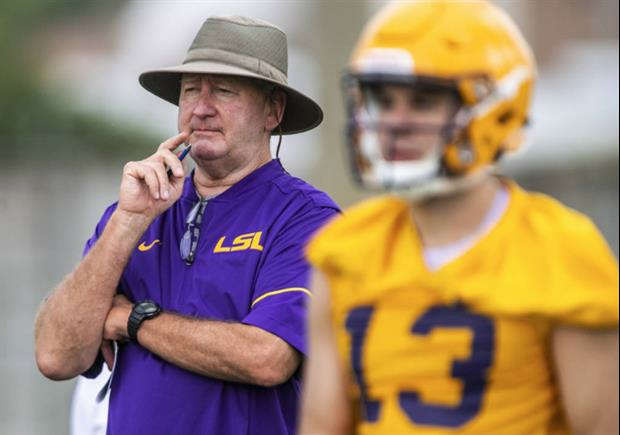 Orgeron was asked Wednesday about Ensminger's return to Auburn and said that he probably doesn't even remember that he coached at Auburn as he is so entrenched at LSU. So entrenched that Ensminger even slept in the office on Tuesday night working on Saturday's game-plan. LSU takes on Auburn Saturday at 2:30 pm CT on CBS. He was so locked in, he was sleeping right through the Southeastern game. At Jon Hamm. That's got to be the dumbest attempt at knowing anything about coaching!!! Obviously you've never coached. Next you're gonna say you don't need audibles any longer as they are pointless...?????? You know you can reply directly to messages right? As an example, I just did it. Good talk. I tried cramming for exams many times in college, which didn’t work 9/10 times. Is this any different? Well at least he did not sleep in one of those dumps on Airline Hwy . He is thinking if I call more than 14 passing plays will Burrow be my QB next week....Probably not...I better save the season....That Auburn DL is no joke. Steve has always slept in the Office and that is nothing new. You know he has been coaching 36 years and OC 6 times. How much prep do you really need to do? Calling plays may be the easiest job in all of football. Success is 95% talent and execution, 5% what play is chosen. I'm pretty sure he is analyzing matchups and drawing up plays to exploit auburns tendencies on certain downs. Sure am glad you aren't calling plays for LSU, sir! The real question is, when did he go to sleep? Before midnight? LOL Can't sleep very well this week huh Steve? Sleeping in the office is actually very common among all football coaches. but should be far less necessary with all the analysts we have now, who do the time-consuming grunt work that used to fall on the OC. agree with atltiger, this is what the analyst do, they are the ones that break down the tendencies and what opponents do on certain downs, find matchups etc... The OC should be the one in charge to know (Why they make so much) what plays in his offense should work vs those tendencies and matchups... if it doesnt, you either have A, bad execution or B, terrible coaching.. Relax, all the questions will be answered soon. Rejoice in the fact that our boys will give their all in representing our state and its people.